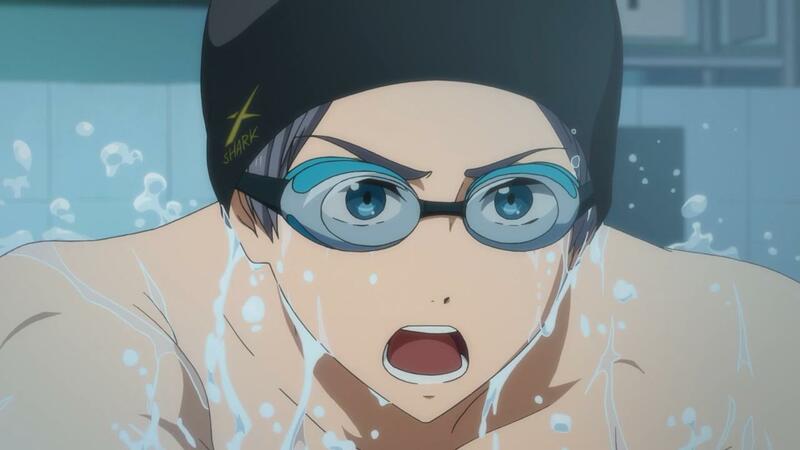 My episodic notes, reactions, and commentary from Free! – Eternal Summer, which aired during the Summer 2014 anime season. I would rather not end this Spring post on M3, so we may as well welcome back the boys of summer as one of the first shows out the door for the new season. The last season of Free! 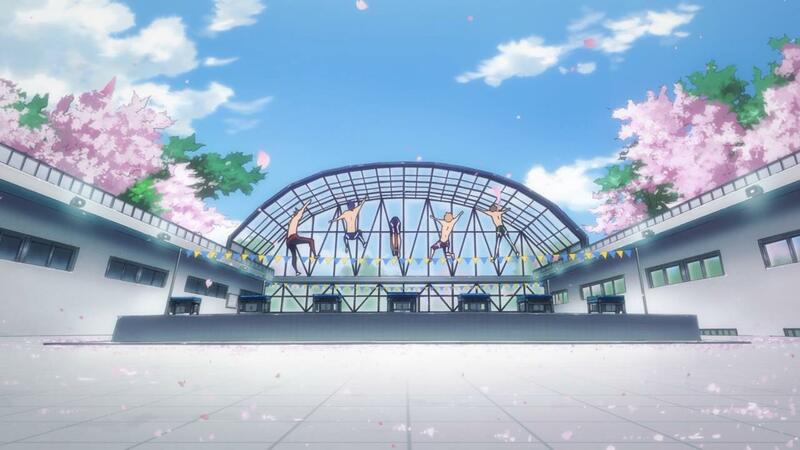 – Iwatobi Swim Club was something I was actually able to watch with a physical group last season every week, and my assessment of the series from that still holds. I think it was a fine at want it wanted to be, which is essentially a “cute girls doing cute things” light sports series except with boys. It had nice water animation, more camp than some grilling competitions I know, with pretty standard archetype characters going through the motions of building up their school swim team and the power of friendship. It was like a trip to the water park, basically, where while there is not really a whole lot of substance one can still have some passing frivolous fun with splashing about haphazardly or riding the slides. And the experience is likely improved in a group, where one can cheer and holler more. Kyoto Animation, recognizing the massive viewer-base this series acquired and the resulting windfall of home video sales, then looks to have turned that dial up all the more for the return trip. To be fair, if someone did not like the first season, I do not think Eternal Summer looks to change their minds. This is doubling down and going bigger than before, with more sparkles, more water animation, more abs, more everything. 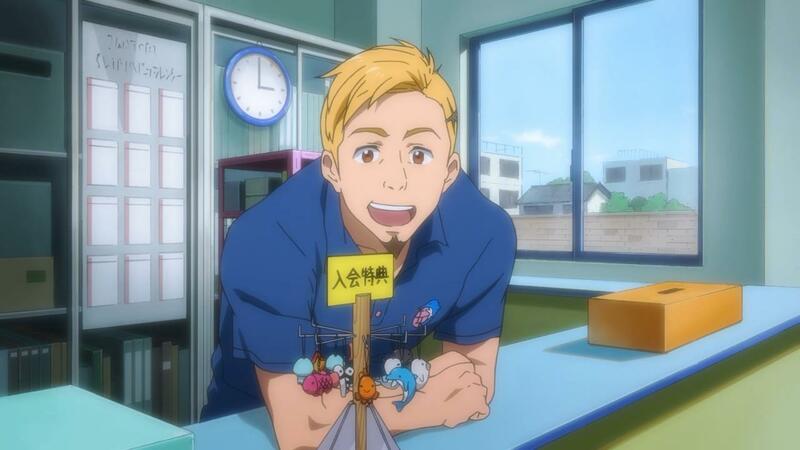 A chunk of this episode was dedicated to our Iwatobi friends trying to recruit new members to their swim team via an auditorium show involving gymnastics, saxophone music, popping their shirts off, and talking about their charm points. You either find that amusing or you get off the bus, because this season long trip is barely even underway. As Rin is back in good spirits with the rest of his childhood friends from last season, we can advance some time a bit and he quickly becomes the new captain of Samezuka Academy as the third years bow out. This, combined with the pool of cherry blossoms to deliver on a childhood memory and the talk of what comes after graduation, seems to be at least part of what the show wants to be playing at for this season: time, growing up, and what to plan for once high school is over and if the swimming would come to an end. Even the end credits, silly as they may be, do have the cast hamming it up in the uniforms of various professions. It is a good direction for the series, in that while I doubt it will try to pivot into a serious drama (I think people would be disappointed if it did) it is a solid natural scenario evolution from the achievements of the previous season. I am not entirely sure if I will stay with trying to write about the series weekly, but I can assure you that I will be watching it each and every time its admission gates open up every seven days or so. Intentionally or not, this episode actually provides a pretty solid visual aid for comparing to the last season, by use of cute mammals. 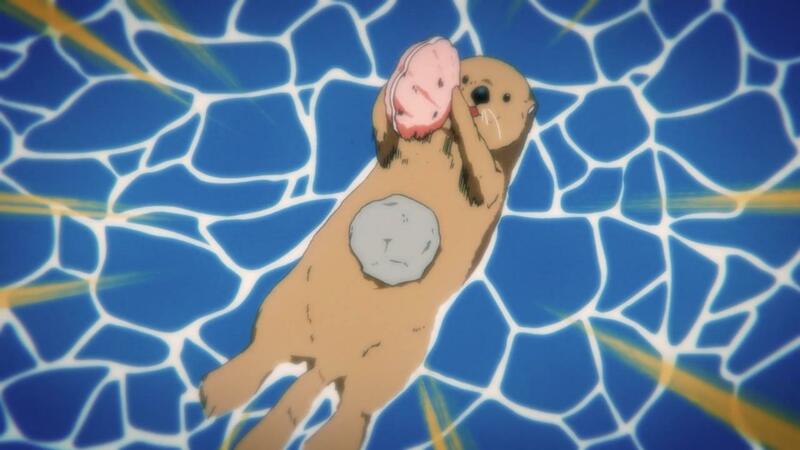 This otter is the first season of Free! Pretty cute, having a grand old time in the water, and sorta coasting along on that while perhaps lacking some definition. 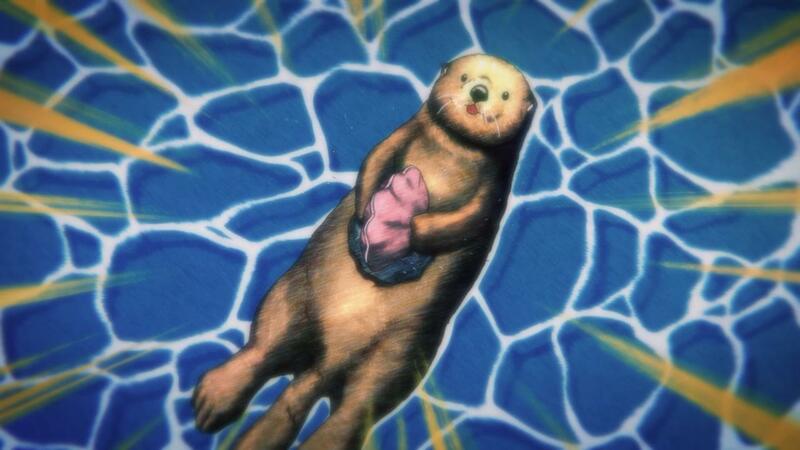 This [same, but few moments older] otter is the second season of Free! More drawing, stronger water effects, a bit of a more refined sense of purpose about itself. But, if you did not like the otter to begin with, one may not find anything the second otter image is up to very interesting. Before this metaphor completely breaks down: I think the aspects where Rin now has to build up this new relay team nifty enough to give it fuel to work with. Complete with his old friend Sousuke who is now overly domineeringly possessive regarding Rin’s relationship with Haruka but while our shark toothed dude seems to also want to retain what he rebuilt last season. Throw into that the notion where Sousuke has already been scouted out, so he already has his post-high school plans in order, and there is the additional levers to add to the conflict vector raised that week. What will come after these days, and if the swimming will have to end with it. And we know Rin wants to break into the more global scene, so him being drawn to what Sousuke may be able to engineer to keep him away from the other has some legitimacy. Plus the fact our cast is naturally split up by going to entirely different schools, adding to the divides that could cause going forwards, and there we go: pretty much everything one needs to have a sequel that is doing new things with the existing universe to keep those who already like the show invested while they also get the visual business, innuendos, and camp we all signed up for. So, yeah, I am still pleased to have the show back for Summer. Despite winning the school wide club field day event, our Iwatobi swim team just can not attract any new blood for their ranks. Which, given the vibes this season was wanted to have so far, does serve dual purposes. It sets up the easy gags where the group clearly prepares for those wide-eyed fresh initiates who never actually arrive, on the one hand. On the other, with everyone advancing through the school years and the increased talk of what they will need to do after graduation, there is the notion of who would come to be able to take over the team once most of our cast leaves these educational halls. Meanwhile, Rin over at Samezuka would not need to be concerned with the raw survival of his team, but still needs to captain the ship to maintain it. 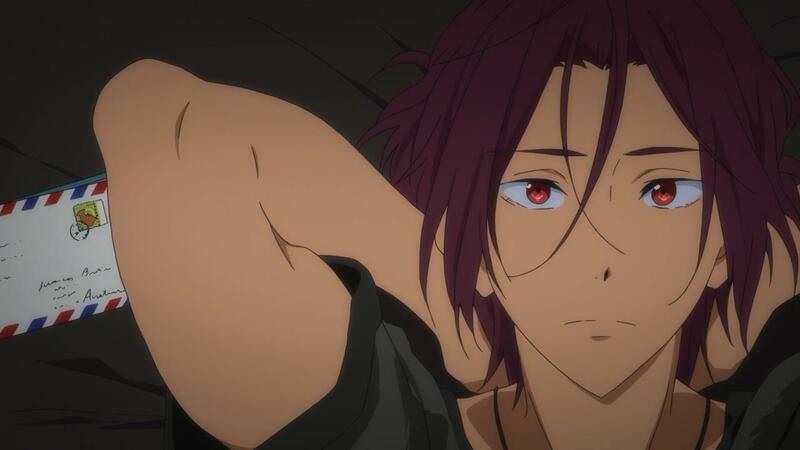 On that note: Rin switching dorm rooms as part of the general advancement of time, where he will be with Sousuke as his underclassman Nitori becomes a more direct senpai to Momotarou does itself also serve dual purpose. It gives Sousuke a more immediate presence to potentially influence Rin’s choices going forwards, as well as elevates Nitori’s levels of character activity and personal narrative. He can not just be Rin’s biggest fanboy forever, after all. There are other responsibilities and potential guidance to provide as well. The primary force driving the drama element of this episode then turns to Rei, and whether or not he will be leaving the swimming club (or Nagisa!) for more land based pastures. Or, at least as much drama as one would be able to wring out of that concept. The club would no longer have its membership quota were he to actually leave, which would introduce a whole other set of affairs that would probably get too cramped for the pace and aim of the series at this time relating to growing up. So it is far more of a “What is he personally working though?” scenario. To an extent, this actually is a nice little reversal on the ninth episode of the first season. 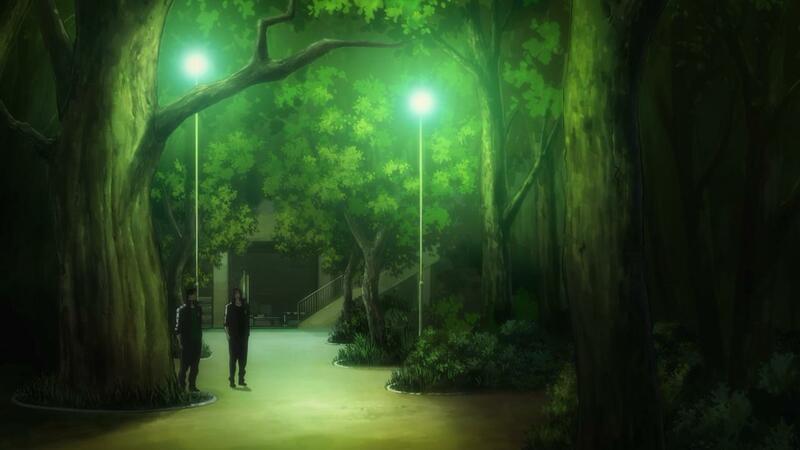 That showing, if you remember, was where Detective Rei not-so-secretly trailed Rin around at the festival to see what he was up to and to let to group better keep Haru and Rin apart. Here, the group comes to eventually track Rei in a similar comedic manner (though I doubt he actually noticed), and come to discover a secret he had been keeping from them. A simple little episode, as with most of the series on the whole, but it sets up a fair amount of what is to come down the road. Spills and splits may have been avoided this week, but Sousuke and how he views his own relationship to Rin is sure to put a strain on that sooner or later as he exerts himself more. An intriguing thing when comparing this season of Free! to last season’s Ping Pong The Animation is this episode the former laid out the “No amount of natural talent trumps hard work” theme at the start of this episode. Meanwhile, in Ping Pong, there are strong character narratives that involves plenty of hard work coming to vastly different conclusions between various people. They are each very different kinds of sports shows, of course, but that even Rowdy Sumo Wrestler Matsutaro!! leans heavily on the natural talent ropes is an interesting divide to have so clearly. It carries down through how the productions are structured on so many levels beyond this, and how they wish to go about their tones and character stories within their respective series sports. I suppose that is not entirely fair or the full story though, in the sense that even the end of this episode Rin is in a far more mixed state than those more clear cut statements relating to hard work he made at the start of the episode. But not in a bad way. Rather, that through our exploration of aspects relating to Rin and how he viewed relay swimming even as a kid, he decides by the end that he wants a relay team of folks who really want to be on said team. Not merely those who achieved the best times in various individual events, but people who wished to be be able to swim together as a single unit. And he flat out states that he knows this is not the “best” way to select a relay team in terms of raw performance, but more of a personal goal or quirk. To swim together with others in a relay once again because they wish to. Which is respectable and admirable, even, as far as a choice goes that could radically affect his ability to be able to swim at a higher level in his post-high school years. We can already call the team now of course (Momotarou, Aiichirou, etc), so the natural conflict then comes from how much of an oil in the water force Sousuke will be going forwards. We already know he is quite protective of Rin, as far as previously wanting our shark toothed captain to focus all of his time on making himself better regardless of others. While he has the nice sentiment of being inspirationally inspired to want to join Rin’s relay team because of the dream Rin shared, I would expect that in time this will sour or crack a bit. Perhaps trying to nudge or encourage Aiichirou via intimidation to drop out down the road, for instance, as perhaps he does not manage to pass a particular speed level. I can not imagine those scenes showing the significantly younger Sousuke and Rin butting heads over theory versus feeling were shown without reason for them, after all. Some of that is sure to come back around again before an eventual making of amends or more permanent split between the two. One way or the other. To be honest, I am kind of surprised that Sousuke’s victory coupon to force Rin to do one thing of whatever he wants was not burned on saying “You can not hang out with X, Y, or X persons” anymore. Or, while that is surely rather extreme, something else to similar time absorption and personal separation effect. He clearly has already been cast in a “villainous” light for this season, given the loggerheads he already reached with Haru previously about not getting in Rin’s way. I just keep waiting for the ticking time bomb to go off. Our swimming boys show seems to have been taking some lessons from Jojo’s Bizarre Adventure, in the event variations of “You thought it was Haru in his bathtub again, but it was…!” jokes have somehow not been driven into the ground already. But, yes indeed, for what looked to be yet another morning sequence where Haru needs to be dragged right on out of his own tub, it turns out it was Nagisa all along waiting for Makoto. 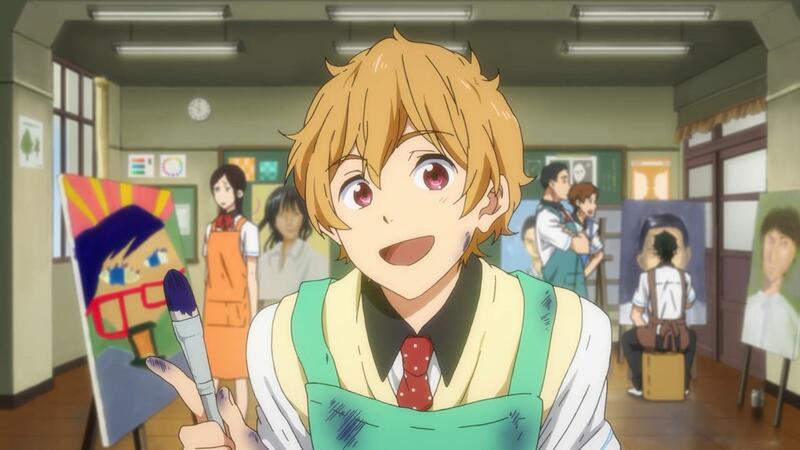 Nagisa, as it turns out, was also camping as Haru’s house the night before. Which is the sort of thing that immediately sets off some signals, at least in my mind at the time, that something was not quite alright. While our four man Iwatobi band do operate together as a swimming unit, they are definitely more paired off between Rei – Nagisa and Makoto – Haru lines which tend to operate more closely together. It is not that Nagisa and Haru could not be casually hanging out in whatever capacity, after all, but in terms of how the show tends to flow this does mean something is likely going on which is putting a strain on him. So too then, in this case. For all of Nagisa’s energetic qualities, to effectively be able to come into and out of a location like hurricane before anyone really catches on to what actually happened, even he can not keep his continuous sleepover game running forever. Nor can his pangea misdirections and mackerel bribery hold up over the long term. Going along with that, when he said he had run away from home due to an argument with his parents, I did not actually figure this was the real answer either. The text message from them that was hurriedly pocked and freaked out about I could certainly see as being a case where he had gone off on his own and the resulting parental worry. But I think at the time I was considering more that Nagisa perhaps had left on his own in some misguided late high school attempt to have more hangouts, sleepovers, etc before graduation. Certainly, we rarely ever seen him and Haru together as a unit, and the like. That it was “just” a case of running away over test scores and the threat that he would get pulled from the extracurricular activity of the swim team works too though, of course. As well as we would get in an equivalent “Girls Doing Things” show, we are presented his tale of significantly more unfun and study filled middle school years. Parlayed as they are to his friends and us within the darkened hall of their reborn childhood swimming club, it sets up a bit more why he is who he is today. Likewise, it allowed for a kind of role reversal between Rei and Nagisa, as Rei recognized himself. Now he can work hard to maintain the membership of the one who used to do so much work to rope him away from the track team originally. It was an episode that does not do a whole lot for the regional and national relays that have been talked up prior. Or those bigger questions concerning Rin and his other childhood friend. But it does give a little more dedicated attention to someone who is usually in a more strict comedic role. If the series had gone just a little further along, it likely would not be able to get away with this episode without derailing a significant event or closing arc, so this was really one of its last opportunities in that department. While it took us most of a full season last time to get to the prefecture level tournament, here we are again! The characters are pretty pleased with this as well. And not a moment too soon, really, as I imagine we have a longer national run to try and fit in this time as well for the second half of the season. In addition to any looming ticking time bomb issues Sousuke is here to introduce. In bringing back the tournament event selection matter from several episodes ago, the notion that Makoto and Haru will be each participating in the 200m Freestyle returns. We see a bit more of their childhood together, which I think is fair as these two characters are the ones who have known each other for the longest period of time, and how they originally came to decide to join the Iwatobi swim club as children. Right up to and even including a bit on where the dolphin imagery that surrounds Haru comes from, via something as simple as a little keychain toy of the animal that Makoto also wanted but decided to switch gears to a clownfish and allow Haru to have instead. Now, I do not think it would have been necessary at all for the show to establish something like this. 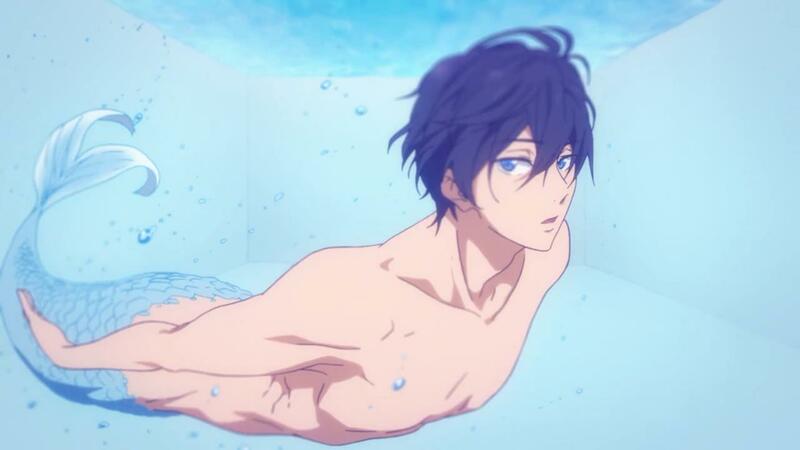 It can just have Haru like dolphins and be associated with them given his enjoyment of the water. But, especially as Haru has retained this dolphin character since childhood while Makoto is now more regarded with whale imagery, I think it was a nice little bit that plays well to how their lives or focuses have developed in the time since. Certainly even the compromise on who gets the little dolphin toy plays directly to the notion that Makoto only wanted to swim with Haru, and allowing Haru to have that toy would by all means do a lot more to keep him around and swimming together in those earlier years than potentially competing for it. There are a lot of smaller bit scenes over the course of the episode, which is fitting for how broken up and structured something like a tournament event happens to be. 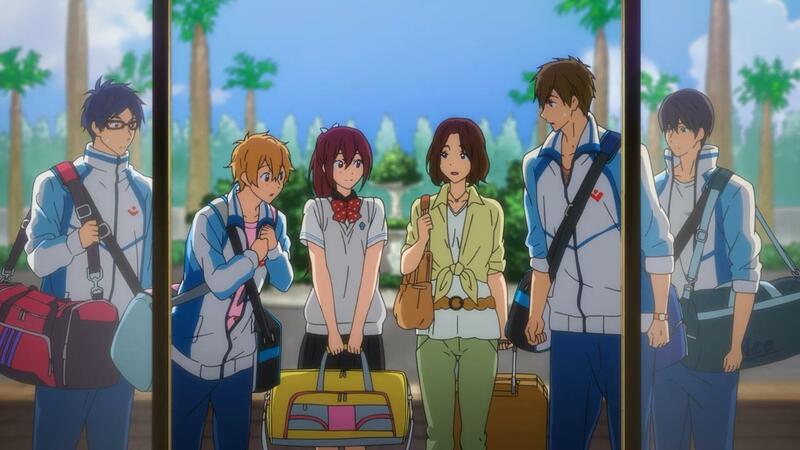 Even beforehand, we get the small but mechanically useful aspects like Rin and Gou heading to their family grave to see their father for a bit before the competition, the outside aspects like the Mikoshiba brothers fawning over Gou together, and Nagisa and his Samezuka equivalent Aiichirou for a little goofy yet embarrassed chit chat together. It does well for setting up the more communal effort of it all, as this season does require a larger cast and more significant influence on the Samezuka side of the narrative equation. That Makoto or Aiichirou go on to not qualify further out of their respective events despite their best efforts is expected, but also setting up elements that will have their dividends further forwards. That when the end of the season come and I assume Makoto is looking back on his high school swimming career after whatever comes of Iwatobi’s national push, he will be pleased despite the loss to Haru here because he was still able to race against his good friend in a tested environment. Likewise, and perhaps far more importantly, that Aiichirou is the clear “weak link” in the Samezuka relay team, which does not sit well with Sousuke at all because of how much he is looking out for Rin to be able to continue on with a higher level swimming career after collect. After his earlier stage private intimidation attempt against Haru we have not seen too terribly much of Sousuke, despite him being seemingly quite relevant to future plot events and how they will play out. That he will attempt to muscle Aiichirou right on out of the relay team is expected, if only because I can not see another reasonable path for their characters to go. It is not like I am cheering for Sousuke to be a jerk and rile everyone up, but more of a consideration that we are about halfway through the season and we are only waiting on how he will do this, not so much on the if he will do it, given the pretty straightforward nature of his character arc so far. As expected previously, Aiichirou did not make the final cut of the Samezuka relay team for the prefecture event. By a younger member of the swimming team taking the spot at that. He must then instead come to contemplate his situation from the sidelines of it all. This does run against what I had been considering before, that Sousuke would have somehow pressured Aiichirou out of the team himself as a part of his efforts regarding getting Rin to think more of his future and such. That his childhood friend would be in a better position to be scouted and the like without being held back by others. We instead see Sousuke give advice to Aiichirou, even if “only” in words he says Rin would say himself. Though in either way it is in stark contrast to his more aggressive exploits earlier where he was significantly more combative and threatening towards Haru to get him to back away from “interfering” with Rin. One would not have necessarily pegged Sousuke to be one encouraging Aiichirou to try even harder, that his failure to qualify for relay participation now in the prefecture tournament does not itself mean he can no longer swim a relay with Rin again. Because there are those looming higher level events coming up. Should one keep pushing, Rin’s biggest admirer still has their opportunity there should things work out. This all links up with Rin and Sousuke clashing together now, even after doing so well in said relay together. Sousuke’s dynamic is one where he came into the show having already been scouted and selected for high level swimming on a competitive level after high school ends. So his powers and abilities in the water, taken on their own merits, have never really been in question. He is clearly a solid swimmer and deemed valuable for early scouting offers, of which he has already accepted. This is known, top level material. And given his prior aggression, he had a certainty of presence where he could be imposing in a scene while doing or saying very little in the interim. The wrinkles then, as they can be better perceived now, may well be more on the end of the matters of the heart front that Rin was speaking of before. That, while certainly Sousuke was inspired enough by what Rin was talking about regarding his old Iwatobi friends and being able to find such synergy through their communal spirit to have made that impassioned plea on a prior night to be included in the Samezuka relay team to see what he was missing, he may well still be missing a lot. Which is to say, as he does himself, that he does not know even now after the tournament if he got out what he was looking for from being involved in the relay team. Much to Rin’s own frustration and discord. In a sense, I can now sort of perceive Sousuke as being very much like a mirrored Rei. Beyond the known butterfly stroke specialty positions they share, Rei is very analytical in regards to beauty, grace, and form, but lacks a lot of practical ability in significant areas. Meanwhile, Sousuke has far and away the performance aspects down to their letter, but in turn the “fluffier” notions are more coldly striped out. Which may well come from a place where, much like Dragon in Ping Pong The Animation, he was worked so brutally hard in his pursuit of meaning and drive in the activity that he may have well lost complete sight on the notion of swimming as a fun sport to play. A game to engage in. And the walls closing in effect that can sort of come along with losing sight of all that. In Sousuke’s case having it dawn on him that he may well not even be looking at the same sport Rin is anymore. Which would be a far better turn of character for him than a more routine cold machination that exists merely to drive wedges and nothing more, so I do hope the series actually chooses to run with that. Things have toned down a bit since the more argumentative issue of Rin and Sousuke last time, as this is very much getting us back to more of the graduation and life choices, that have been something of a on and off guiding force topic this season. To that end, we have Makoto assisting with swimming lessons at Gorou’s revitalized Iwatobi swim club, and Sousuke comes to taking time of his own to coach Aiichirou in his goal to be able to swim with Rin before Samezuka’s competitive year is over. There is a nice contrast in, in that when Makoto shares what he has gotten into in the teaching department with his teammates the conclusion they all reach is there would be greater benefit for the three of them to continue to work on themselves rather than join him. For understandable reasons of course, as the show has already mentioned matters like Nagisa needing to improve his grades. Meanwhile, Sousuke looking out for Aiichirou’s continued advancement is something that I feel is implied to be something he would be keeping low on the radar. That Rin happens to stumble upon them by chance is no matter, as he reflects on the swell moment without breaking into it or otherwise making his presence known. While these latter swimming training moments do not receive anywhere near as much as Makoto’s sessions, I would think Sousuke’s intentions would be to downplay his involvement in Aiichirou’s advancement so that the progress of this younger student would look better when actually shown off. It is not like he was not already practicing, after all, there was just a less than optimal level of form involved. And as we ourselves come to learn that at some point in the recent past Sousuke has been to the hospital for his shoulder, he may well know a thing or two about bad form or overworking oneself to physical detriment. As for the primary top level plot of the episode, Makoto teaching his students and in particular the little boy Hayato Kisumi, it harkens back a bit to the midseason island training episodes in the first Free! – Iwatobi Swim Club. More specifically, we learned at that time Makoto suffered from thalassophobia (fear of the sea). While I would more than hesitate to classify Hayato’s circumstances as raw aquaphobia (fear of the water), he is by all measures afraid of swimming in the pool sans kickboard as an understandable reaction to a past drowning scare. I feel Makoto’s previous reactions on a similar level, insofar as having no previous bad experience with the ocean until his fisherman friend was killed in a storm and thus having adverse reactions to deep sea water despite being very good at swimming on the whole, are a good thing to thematically touch base on again here. Likewise with the more newly revealed information of his own earliest swimming sessions being unfruitful until he came to learn the backstroke. While all very simple as narrative construction, it all plays well to the notion of him having particular experiences and perspectives that make him quite valuable and good at providing guidance and teaching experiences in these kinds of situations. Which, for a season that has the creeping threat of graduation in the background, is something important for him to be realizing now when it comes to potentially deciding what to do next with his life. Haru, meanwhile, still does not have much in the way of answers. Despite saying and doing little this episode, his general agitation or unease levels seem higher than normal, particularly at the sight of someone, Shigino Kisumi, he knew from middle school. Everyone keeps getting older, after all, and Haru just wants to be able to keep swimming. I actually only have three notes for this particular day at the pool. Which is saying something, when one considers I can and do usually fill a lot more space with stream of conscious observations I then try to come back to. But, that does not necessarily mean I have less to say, so let us work through them. The first related to Aiichirou doing well, and at that we can be pleased he managed to make the progress required to achieve his goal of wanting to be on Rin’s relay team. It is how we start the episode at that (at least insofar as others at Samezuka marveling at his improvements, while his actual name being called for the team comes later). Which for Rin’s Ultimate Team initiative, in an attempt to forge something at his own school he can be personally proud of even at the potential expense of raw time in other areas, is a good achievement for a character who was largely a hanger on and bit role during the initial season. Really, it would not surprise me if Eternal Summer were to continue on long enough to where Rin needs to hand over the Captain position, that it would likely fall to Aiichirou. With likely a sentiment where he would seek to carry on with trying to make a new class generation of swimmers at the academy and instill the feeling of swimming Rin was able to inspire within him, despite Aiichirou himself not being as good as many of the other swimmers previously. On a second and third front, as they sort of blur together or overlap, we have the more significant meat of the episode. Haru’s nightmare sequences, all the way from stress running to actual sleeping insurrections complete with mannequin or ventriloquist dummy looking people, and the constant presence of scouts for an event like regional qualifiers. It has been something sort of hinted at, or at least material one could extrapolate from, but given an overall message of this season being what one swims for and what they will do once high school actually ends it is an angle that needs addressing. This is the highest level of competition we have seen from our main cast to date, and it does have an impact on their potential futures. Doors open by doing well in tournaments like this, as opportunities for further advancement will arrive. Haru chose to shut those gateways down, right in the middle of his individual event heat. It is an understandable angle, really. One I can even identify with a bit personally, on a certain level. I used to play a lot of soccer as a kid, namely. Like in the two to three leagues a year sort of frequency. And I carried on like that up until around middle school or so, because the game was becoming less about, well, a fun game and general strategy concepts and much more clinical and surgical. Even in middle school, teams that seemed as though they were trying to intentionally cause injuries on the other side so as to hamper if not this present game then matches down the road for the eventual final league tables and the like. Things were becoming less like the game I wanted to be playing. So I stopped participating, albeit not on the more dramatic or last possible minute level of Haru quitting in the middle of a match. His concern and emergency stop are quite real though, because his present position did mean he was on the cusp of his swimming becoming more of a colder, mannequin like robotic performance for crowds and accolades he did not care for. It is a kind of surreal pressure that gets placed on ones younger mind, as something that was once a fun game or actively slowly threatens to morph into something where they are not even sure if they will recognize the activity if they keep going to higher levels. And if one is participating so as to express themselves, like Haru with his swimming, that is a concern when the sport itself is one which can be locked down to the milliseconds of form. It is not like, say, a card game where Haru is using a suboptimal but good for him decklist that he can play well. Swimming is a lot more clear cut. So he too took a clinical step in withdrawing. Ping Pong The Animation last season was by and large about a cast of characters who either had or slowly did lose their way regarding why they even played the game to begin with, and how they developed from there or found their way back again. Haru managed to keep himself from slipping down that path for now, though how his relay team will react to all of this more prominently next episode I am sure will be significant as we move into the last stretches of the season and their potential final high school swim meet together. This has been a heavier season than the original series, on the whole. Initially we had our our head nods towards looming graduation and life affairs, then ramping up things to situations like Haru last week quitting in the middle of his race. Here then, we have the relay between Samezuka and Iwatobi, while also even prior to that needing to deal with the reasons for Sousuke’s shoulder acting up. The series has three episodes remaining after this, which I would have to imagine would be an arc regarding anything to do with nationals, and more prominently needing to deal with the guidance counselor form Haru and the like keep putting off. 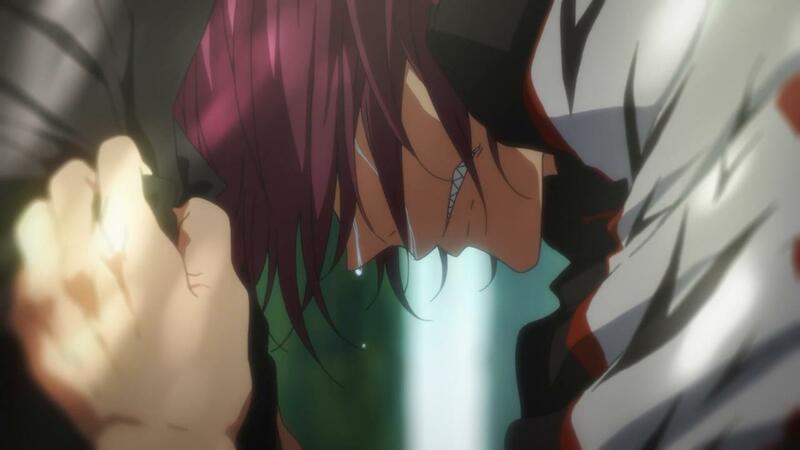 While some would see it as more on the contrived side, personally I am fine with the idea Sousuke attended the regional swimming event last season and was in a position to see parts of Rin’s meltdown and resulting turnaround as he came back and enjoyed the relay with his friends from another school. It is not like it was a smaller event with smaller stands, where attendance would be lower and Rin would have had a higher chance of seeing Sousuke. So I am willing to throw the situational convenience of it all a suspension of disbelief bone for plot purposes. Much too like Haru being in a position to overhear Rin and Sousuke talking about the affected shoulder the latter possesses and the lies he had told regarding being scouted and all. It keeps things compact without affecting overall flow too terribly much. Some would say the series could have jettisoned a more comedic episode to draw this out longer or more “realistically,” I would hesitate to pull the trigger on such a notion. This season does need those more carefree moments in the front episodes to set up more what these characters will be afraid of losing as they get nearer to a graduation scenario. It is why Nagisa was in the personal situation he was in a few episodes ago, it is what Sousuke was even now still trying to search for going into the relay we had here today, and so on. All these aspects of being together as friends while also enjoying their swimming with one another as a unit. Which is, of course, what a relay functionally is. That this situation plays out here in episode ten I feel is, for now, a good move. In many ways this is a climax to the more showdown oriented narrative beat between on the Iwatobi versus Samezuka direct competitive front, while still leaving three whole episodes for aftermath affairs and the actual character beats to resolve later. I think that is a healthy move for the series to take, and not merely because it avoids the issue of having a similar finale as it did in the first season. Kyoto Animation clearly wants to lean on this growing up, Is There Life After High School Swimming direction, as has been brought up throughout the season. Here now, they have given themselves ample time to work through whatever else may happen in Iwatobi’s national run and amongst the characters themselves. There is the sense of wanting to provide a kind of finality to it all and give more of a send off than merely sputter along to the of end of the series. Which is a nice move, for a show which has done as so very well as this has for them. I mean, when one gets right down to it, the only way we would have a third season of more high school swimming out of Free! would be if it turned into Free! The Next Generation. Seeking to wrap things up more properly and give a satisfying conclusion is a far better move than just drifting along with the expectation the home video discs will sell regardless of what they did. It would, well, mean that the characters themselves would get to be free too at the end, rather than aimlessly and forever caught in a more passionless second season. There is a level of joy and a significant amount of, well, the opposite in the water this week. Good news first: Momotarou gets to be the in-dialogue champion of the There Is No Such Thing As A Last Summer concept in the face of changing times and looming graduations. This is, of course, what the ideal version of events one would extrapolate from the Eternal Summer title. That just because one is out of school, their friendships made there can endure past that and the swimming will always be able to continue long into the future. I feel it is important that, as a newer member to the cast for this season (thus needing to bond with his teammates), one of the youngest swimmers of any of the main characters, and the sibling to a character who has already graduated, that he has this point of vision to impart. 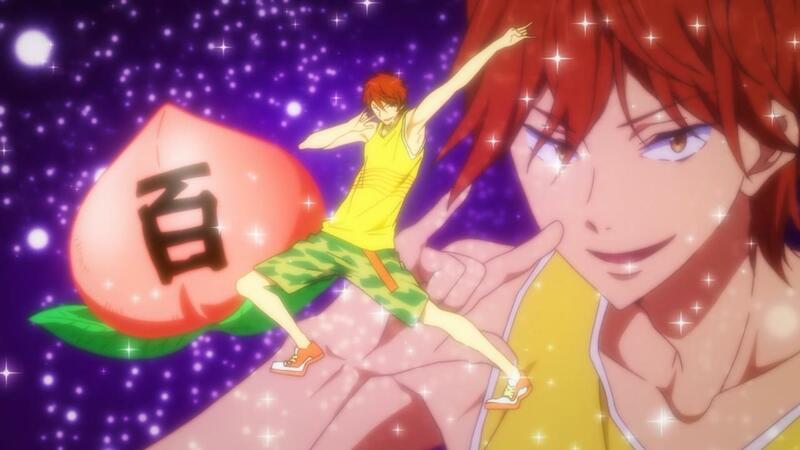 Arguably, Momotarou would be the most objective of the eight main swimmers between Iwatobi and Samezuka. Everyone at Iwatobi is well connected to each other now, Haru and Rin have their history together, there is the vectors of Sousuke and Aiichirou and their own times and relationship with Rin. Momotarou, by contrast, is just sort of orbiting around this group. Not that he is disconnected; he and Aiichirou clearly get on well, for instance. But he does not have months to years of being entrenched in a personal relationship web with anyone here where he may worry more about the graduations and such. As a result, he can provide rather appropriate advice and insight, which can be difficult when one may be more personally close to the situation. Even (or especially) if many of them are friends. 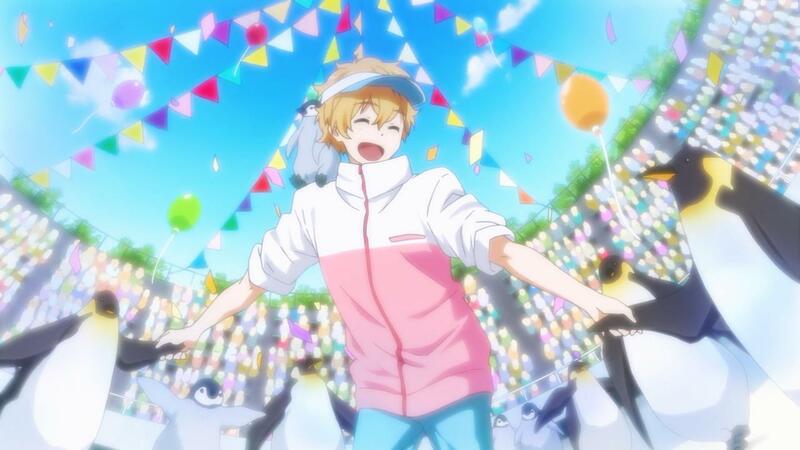 Elsewhere, our Iwatobi friends get their congratulations from the school for qualifying for nationals. Not as a large scale pep rally, no, but personally and on more individual levels. This is, again, rather crucial. Were the situation portrayed as a wider scope in a gymnasium or auditorium, with the entire school looking on and clapping or cheering among a giant but difficult to parse out crowd, that would play directly to the kind of situation Haru sees as meaningless to his goals and why he personally swims. That these more direct and for lack of a better word intimate congratulations and support are provided, and Haru is still reacting with negativity and dismissal, then lend greater credence to the issues he is contending with than if things were “just” a pep rally. The long and the short of the matter is, he has been going through a lot of classic symptoms of depression. The type that affects one over long periods of time, impacts their interactions and social lives, can become internally destructive as the mind does its loops, and so on. His avoidance of what to do with his guidance counselor forms, not being interested in the scouting offers he received, to outright stopping in the middle of a race that would have surely acquired him additional offers had he continued. But he could not bring himself to do so. Remember, there were even murky metaphorical tentacles during that scene that were effectively these emotional issues surging about. And there are a lot of really, really complex and understandable reasons for anyone to go through longer term depressive episodes. Fears of change would certainly be one of them, as actively working on things that signal or could result in alterations of the status quo (like the forms, or winning his individual event) then makes the reality of such events far more “real.” Present, and inescapable. And yet not merely a fear of the future, but so too that others are getting their plans in order around him. Goals and dreams they have for the future they will be hoping to work towards after high school, while Haru sees the conclusion of high school in and of itself as the end. And we have Sousuke turning to Haru now saying if he stops swimming it could impact Rins desire to swim as well, which is a major turn from their earlier interactions. 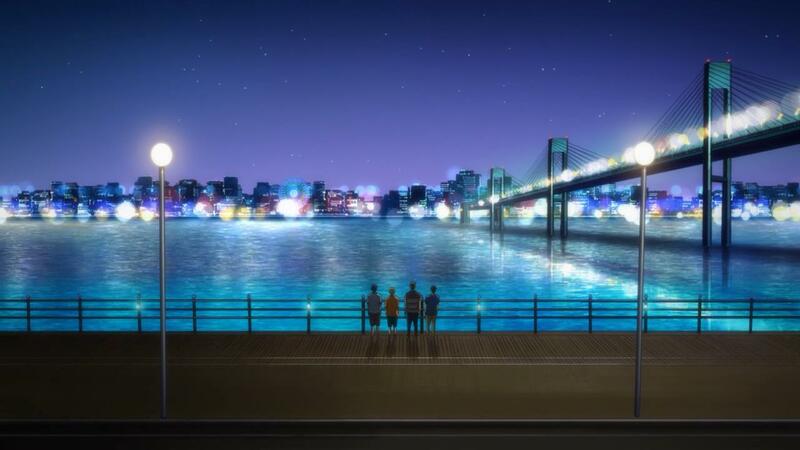 We have the Iwatobi team vritually having an intervention during the holiday event fireworks they attend. And, indeed, even Makoto having decided that he will be leaving to attend university in Tokyo. It feels like a betrayal of sorts to Haru, because this is truly a kind of last straw. And it is difficult, when one is in a mental situation like his, to not see it as such. That there is an somehow an antagonism in others as they move forwards but one feels, as Haru himself does, like he has no future or dream of their own. That they personally wanted things to merely stay as they were, somehow, and achieve a kind of eternal summer through that. But that is increasingly becoming apparent of not working out. And it is troubling to him. Haru and Momotarou do in their own way have very divergent opinions on what a never ending summer would look like in their respective situations. That we have the view of the effectual poster boy of the series and the one of the closest thing to an outsider is, I feel, a simple but effective delivery on ideas the show has always been hinting at this season it wanted to bring up as we came closer to the ever forward march to the end. Second to last episode of the season, and with that we bunker down to focus on but two characters. The childhood friendship thread between Haru and Rin. While last season Rin was brought back to reality by Haru and friends in the Japan he had returned to, here we head around the country he had previously left for. Australia. The pacing slows down even more than the previous more dramatic episodes have been, but in a generally warmer and more personable way. This is a big change of location, and two people who have known each other a long time and are now in a different country. Tonally, things are rather warm in these interactions, even if the actual weather in Australia at the time they are there would be on the winter end of things. An interesting thing in how all this plays out is Rin mentions on the beach that he was rather certain Haru would never agree to taking this trip with him, and if something had happened. So this is not a situation where, for instance, things worked their way down the grapevine and Rin learned of the meltdown Haru at at the festival just the other night. Given the character expressions, he was guessing when he was prodding if a fight had broke out between Makoto and Haru. Though he did also know Makoto had decided on what he was doing with his post-graduation plans, and the dialogue indicating Makoto had talked to Rin about that directly before, and how excited the Iwatobi High School swimmer was to share it with Haru later. We in the audience, naturally, know things had transpired a little different last time around. These more personal exploratory prods are interspersed with Rin sharing things from his own background, and largely cluing his friend in on more of what transpired for him while he was away in Australia. Situationally, while this does work to inform the viewers of this information as well, I feel it played out in a way that felt appropriate to the narrative at hand. Haru is, at his core, a bundle of mixed up feelings at the moment. Depression, anxiety, anger, confusion, etc. Even the first fight with Makoto on top of all that. So Rin talking about some of his own fears that he had gone through in the time they were apart during the study abroad process is entirely warranted in my eyes. It feels appropriate, and organically acts as an opportunity for him to touch just a little bit on things like having homestay parents before actually coming to introduce Haru to them. We have not gotten to see much in the way of parents in general during this show, so these folks are very particularly special as a narrative moment and the series of interactions which follow. The English, as much of the commentary I have already seen about this episode has mentioned, is excellent here. Both in how the homestay parents, airport personnel, and so on sound on a natural level, but so too in having Rin get to act as translator and general handler of affairs (like at the hotel desk) for Haru. In my own experiences with study abroad and other international trips, I have certainly been in situations where I have needed to rely extra hard on having someone else handle language and conversation for me, so I can by all means identify with what Haru is going through during these scenes. There are parts he can understand, and others that go far and away over his head. But he has the visuals of things like Lori winking at him after mentioning his and Rin’s names (which he would have picked up on at minimum, so it knows it was about them), plus Rin’s embarrassed reaction. So too can his eyes dart around to try and pick up on non verbal stories, like pictures in the house. A viewer can in a way leave it up to their imagination how much of the little dinner conversation at the table about younger Rin’s depression Haru would have picked up on, as it went entirely untranslated. Understandably, as Rin was more caught up in reacting to the moment. Traveling is an opportunity through which folks learn a lot about themselves, and indeed each other should they go with others. And there is what I find to be a personally fascinating leader – follower vector which can come out of not everyone knowing the same language in a given conversation. As Rin recognizes that he always had Haru leading him by being a swimmer to strive for, him coming to quite literally take on a guiding effort for his friend here in this foreign country feels great not just as a raw narrative gear but as a swell series of character moments between and around them. Fundamentally, this is largely an episode dealing in trying to wrap a big bow on the entire package. Kyoto Animation serves up large portions of flashbacks, reminiscing, and so on so we can send everyone off into whatever the future holds for them. In the immediate reactions I was observing via Twitter and the like, I can understand how this could be seen as somewhat disappointing, or taking a bit of the wind out of the sails since last week. And episode twelve really was quite a strong episode for what the series was going for. Anything related to a climax or the like has already elapsed prior to this. 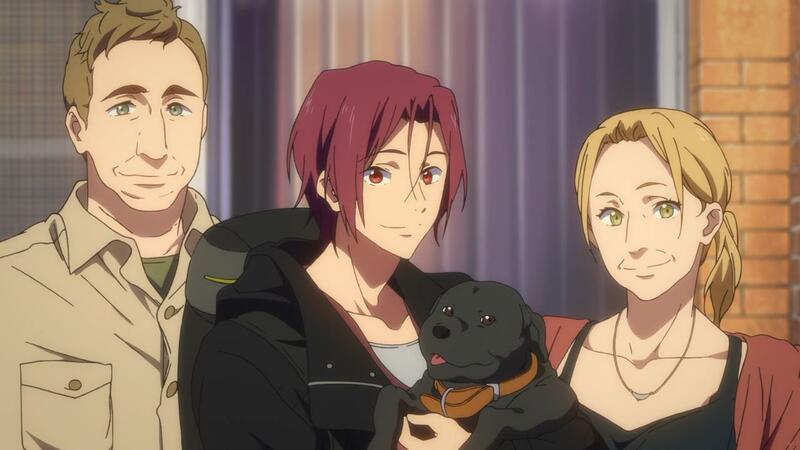 Compare to the finale for the first season of Free!, which had Rin’s outbursts and threatening to quit swimming and folks like Haru managing to rope him back into the swing of things again, and this Eternal Summer could seem quite tame between the two endgames. I think this sort of misses the point, however. A whole lot more of Eternal Summer has been about pressing personal issues regarding high school, looming graduations, change, and such. So by cleaning everything up ahead of the finale, right down to Haru finally figuring out what he wanted to do with his life going forwards, it does allow breathing room for the characters to both come back together and depart on good terms. Remember, the last time Haru, Makoto and all the rest were together there was a big fight and a lot of strained emotions. So that this finale is more about making up and making good on those relationships, to remember the good times they had together before they have a final high school relay race at the nationals? That is thematically apt, given the higher drama levers this season has been leaning on versus the largely more comically slice of life charged first season. This does mean there is a nice amount of recycled footage on display, as the characters think back on various things down by the river at night. So on a more mechanical level, I can sympathize with those who many have wanted more raw original footage as a sendoff. Maybe one last hurrah as a group of friends outside of a swimming environment prior to the last race or something. Like maybe seeing more of the dinner scene provided courtesy of adviser Amakata. Certainly, the big tournament day itself was probably always going to have a less central focus, and indeed there is not so much a race with any tension or concern for wins, losses, or even who are in the other lanes. Much like the last season, we get our spirit animal send offs for each member of the central team, as everyone is just enjoying being involved and swimming together towards a common goal. And that, I feel, is fine. We do not even learn until a few scenes later they came in sixth place at the end of it all. The sport is just a framing mechanism for all of this material about friendship, spending time together, and self improvement to play out and that is A-OK. Looking back on the entire series, I can not quite shake the notion that folks we met along the way this season like Kisumi and especially Sousuke existed more to serve as narrative gears and tools of the writing department. Sousuke’s role at the start did seem to be alluded to and framed as being far more important to the overall events of the show and perhaps shaking up character relationships. But it is certainly hard to try and wiggle a new character into a cast for a show like this, and that Eternal Summer comes to lean more on the relationships we already know outside of the new guy’s shoulder secret and his contrast as someone with a personal swimming goal he may be held back from. All in all though, I would say this was solid as a sequel show. It did not get lazy and rest on the sales success of the often carefree first season, and instead pushed for something that had far more serious tones, hoping the viewer base would follow along rather than quit because the fun times train took various detours. Things were structurally shaky at a few stops, and some sequences definitely may have laid on character tears and such hard enough at points where it took me out of the moment. But it graduates with a good head on its shoulders, if this is indeed the last we may see of this series.